The advancement of technology means that IT is starting to dominate businesses in the U.S. After all, a poorly sized server or an unreliable network can damage a company’s profitability. The equipment locked away in the server room and the wiring closet needs to be reconfigured and replaced as the business it supports grows. Newly developed equipment and the expanding opportunities presented by the Internet require network and server managers to constantly update their knowledge of current trends. The latest movement – the Cloud – is proving to have a monumental impact on IT departments across the country. This means the size and importance of your server closet depends on whether the Cloud becomes a dominating force in technology services, or if businesses decide to invest in data centers instead. When it comes to the Cloud vs. data centers, here is a complete guide to compare the differences and reveal the future of the closet. To put it simply, “data” is just “information.” Any piece of paper held in a filing cabinet is a record of information. In the days of filing, the stacks of paper seemed important, but they weren’t – the information typed onto the paper was important. Throughout the 1980s and 90s, the Information Revolution soon put PCs on every desk and swept away all the paper. When visionaries talked about “the paperless office,” the people who were always too busy to do all the filing scoffed that it would never happen. But it did – databases replaced the filing functions of businesses. As businesses automated their procedures, they realized that data entered in one department was also required in other sections of the business. For example, the customer contact information compiled by a sales representative needed to go on any sales order written for that customer. Italso needed to be listed on the invoices issued after the delivery of goods. By centralizing information in a database, businesses removed duplication of data and reduced the possibility of incorrect information being held. Database management systems increased efficiency by removing points of duplicate data entry. They also enabled software to access information that could be manipulated to automatically generate many of the reports and accounting statements needed to run a company. The unification of information storage, data management and data analysis software support required the creation of a new business function: the Data Center. The data center is a business function that exists to support the company database. The theory of centralizing data makes it accessible throughout the organization. However, in practice, access is restricted to make sections of the stored information available to different departments. This means certain grades of employees won’t have the same privileges to data access as other employees do. Personal data, such as payroll and HR records, are required by law to be protected, as well as customer data like credit card details. User accounts and access rights need to be created and administered, making the data center a more complicated undertaking than merely database administration. The physical security of the hardware holding the data is also a consideration, as well as the prevention of damage from fire, water or improper ventilation. Protection from data theft, mismanagement, and hardware failure, viruses or errors all add to the data center’s responsibilities. Data integrity through version control and disaster recovery procedures are even more activities the data manager has to consider. All in all, storing data in a company that would rather focus on its core activities can be a strain on management time and resources. Finding skilled staff and budgeting for the high pay of specialist technicians is a difficult task for small companies, or businesses in unpopular or remote locations. Retaining key staff can be another problem, because the staff’s skillsets are in short supply and are sought-after by dozens of competitors. Hazard costs, legal responsibility costs and staffing issues are all factors that can persuade a company to outsource their data management. Contracting a specialized company to manage data removes non-core considerations from a company’s activities. The data processing provider specializes in IT and is better able to assess and retain staff than a non-technical management team. An outsourcing contract also has the added benefit of controlling costs, because the serviced company gets a written price pledge — this eliminates any nasty surprises that staff pay raises or hardware replacement might cause. Outsourcing gives your business a guarantee of service level that acts almost like an insurance policy. Historically, filing cabinets were always made of metal because the information they contained was vital to the survival of the company. If the building caught fire, the filing cabinets would get hot, but usually, all the information would survive. Computers, on the other hand, are a lot more vulnerable to temperature damage. Once the hardware is broken, the data is lost. Companies managing their data in-house in data centers regularly back up their databases as a matter of procedure. The backup is necessary both to guard against data corruption and physical damage. It’s a common procedure to send those backups to another location. Businesses that have several locations can consider managing the storage of backups themselves. However, most companies prefer to pay a third party to store this data. Contracting data storage for backups is considered a halfway house between in-house IT services and outsourcing. There are many degrees of configuration between the two extreme strategies of an entirely self-managed data center and an entirely outsourced one. For example, a business might manage all of its data center activities, but send its backups to cloud storage. At the other end of the spectrum, all data entry and access can be performed via a cloud-based application, saving the information directly into cloud storage with a contract in place for data backup. However, even in an entirely cloud-based environment, the contracting company still has work to do. Databases need to have a structure and the reporting formats need to be customized. The company still needs to employ a database manager and an access manager on an ongoing basis in order to maintain the data, create user accounts and manage them. No matter where or how a company chooses to store its data, data owners still bear the ultimate legal responsibility to secure that information. Data compliance officers may worry that sending the company’s sensitive information out of the building exposes it to the risk of industrial espionage and identity theft. Regardless of what clauses exist in the service agreement with the cloud company, your company is still exposed to litigation, or even the arrest of your officials, if data protection procedures fail at the cloud service provider. This is why it’s important to trust your cloud service provider and learn everything you can about their security procedures. Jon Sevel, President of CoastTec, explains, “This latest advancement of the Cloud has been the biggest change in the Data Center in the past six or seven years.” Business managers must decide whether to manage data in-house in a data center or outsource IT functions to cloud-based services. The decision greatly influences the size of the IT department and the equipment it manages. However, other data processing and computer services in the company might keep the IT department busy, even when the company’s data services have been outsourced. For example, companies also use productivity software, such as spreadsheets and word processors. Managers and staff still need terminals, laptops or PCs on their desks to access the cloud. Even if your company manages to find cloud-based versions of all your necessary software, you still need hardware to access it. Middle-sized and large companies still need to have IT departments, although sole traders and small businesses may be able to get away with self-maintained equipment. A small business or sole trader also only needs a WiFi router to access all software on the Cloud. However, a business with many employees needs to connect its staff to the Cloud, which means they need a network. “The network infrastructure has become the forefront of the office environment,” warns Sevel. The advancement of network technology makes businesses even more dependent on the smooth running of their IT services. A failure in the company network affectsll phones, email messaging and customer contact, whether the software and data storage is in-house or on the Cloud. Part of any IT department’s responsibilities is to maintain equipment and prevent damage. One potential hazard to servers and electronic equipment comes from an irregular power supply. Even the most civilized and well-supported regions of the world get power surges and momentary breaks in service. These two factors can cause a server to crash and a network to fail. Both an unexpected shutdown of a computer and interrupted network service can cause damage to data and loss of work. IT-dependent companies usually have backup generators for unexpected loss of electricity services. But even with an automatic switch, the lapse between a loss of power and the ignition of the generator creates a short gap in the power supply, which is enough to knock out a server or a network. Generators also don’t protect equipment from spikes and surges in the power supply. Sudden oversupply of power blows circuitry in computers and network equipment. Although your company may be protected by insurance for damaged electronics, the time it takes to locate, order, and install new network and computer equipment can leave your office staff sitting idle for days. This is why network and server managers deploy a special piece of equipment to regulate the power supply and eradicate dips, spikes, surges and outages. It’s called the UPS. 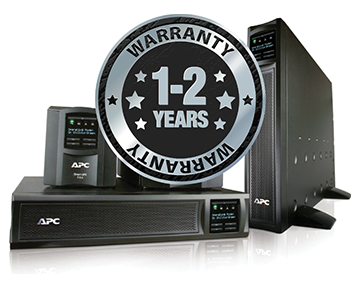 An Uninterruptible Power Supply (UPS) is based around a battery, and it balances irregularities in the power supply. It is common practice to have one UPS for the server and another for network equipment. If the company network has cable runs long enough to necessitate repeaters and switches in the wiring closets, UPSs should be placed in these locations as well. Companies that provide desktop computers need to run supply for the equipment through a UPS. Companies that run their supply through a UPS also don’t use it for the entire office — although a UPS can provide power for up to seven hours, it’s not generally deployed for non-essential functions such as lighting. Old-timers in IT remember when the server room covered a lot of floor space. However, with few companies running mainframes and no need for tape drive cabinets, the space required for the server room has been constantly shrinking over the past few decades. Network devices, such as switches and routers, have also been shrinking. They can now be housed in slotted cabinets called racks, making space efficiency even more pronounced. Even servers can be stacked as blades in racked cabinets. The UPSs in the room are sometimes slotted into the network rack or may be stand-alone tower units. Very large UPSs can also be the size of a large closet. When something is too important to fail, you need a backup strategy. A volatile power supply can sabotage your company’s journey. The relative merits of the Cloud vs. a data center are moot without reliable communications equipment. This is why a company’s UPS is quickly becoming its most important piece of equipment, and it needs insurance. Many companies expect businesses to throw their UPS away and buy a new one when the warranty runs out. Fortunately, you don’t have to throw away a fully functioning UPS just because it is out of its warranty. CoastTec offers maintenance and insurance services for out-of-warranty UPSs, so they are able to continue serving you and your business. Our Comprehensive Protection Plan offers warranty extension and guaranteed maintenance. Contact us today to learn more!